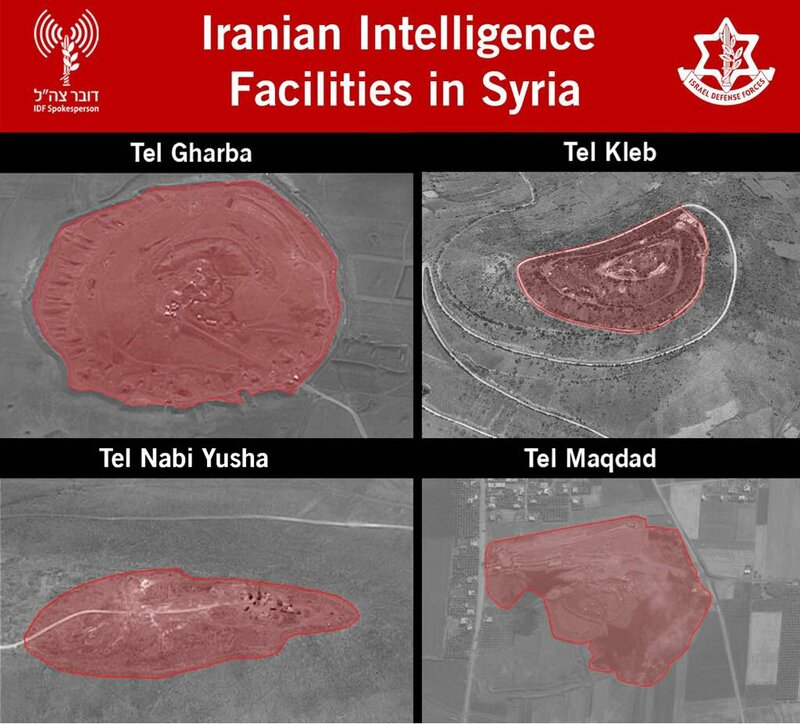 The Israeli military published pictures Friday that it said showed Iranian intelligence installations in Syria that it attacked during a massive bombardment a day earlier. The attack was in response to a volley of rockets shot toward northern Israel. Included in the aerial photos showing the sites before they were attacked are pictures of installations at Tel Gharba, Tel Kleb, Nabi Yusha and Tel Maqdad, according to the Israel Defense Forces spokesperson’s unit. The pictures could not be immediately verified. On Thursday morning, F-15 and F-16 fighter jets bombed over 50 Iranian targets throughout Syria as the Israel air force carried out an extensive campaign, dubbed “Operation House of Cards,” to try and destroy Iran’s military presence in the country, the army said Thursday. The mission — the largest air campaign carried out by Israel in Syria in over 40 years — was “very successful,” a senior air force officer said Thursday, but warned that Israel believes that Iranian forces in Syria are still in possession of surface-to-surface missiles that could again be fired at Israel. The sortie came after Iran fired 20 missiles toward Israel just after midnight on Thursday morning. Four of the missiles were knocked down by the Iron Dome air defense system and the rest failed to reach Israeli territory, according to the IDF. The army also published pictures Friday of what it said was an Iranian Quds Force compound in al-Kisweh, south of Damascus, and an “Iranian Logistics Compound” 10 kilometers northwest of the capital. The army did not specify exactly where the logistics center is, but identified warehouses, offices, a gas station and a headquarters in its picture. Al-Kisweh was identified last year as the site of a possible Iranian base in Syria, and has been hit several times by reported Israeli airstrikes. The picture published by the army claims to show large storage buildings and logistics vehicles. On Tuesday, an apparent Israeli airstrike in the area reportedly targeted an “arms depot belonging to Hezbollah and the Iranians,” according to Rami Abd el-Rahman, director of the Britain-based Syrian Observatory for Human Rights. Thursday’s sorties targeted IRGC intelligence centers, weapons depots, storage facilities, observation posts, and logistics centers in Syria, as well as the rocket launcher that carried out the initial attack, the army said. Defense Minister Avigdor Liberman said that the IDF had destroyed “nearly all” of Iran’s military infrastructure sites in Syria. In addition to the strikes on the Iranian targets, the army also targeted multiple Syrian air defense systems. 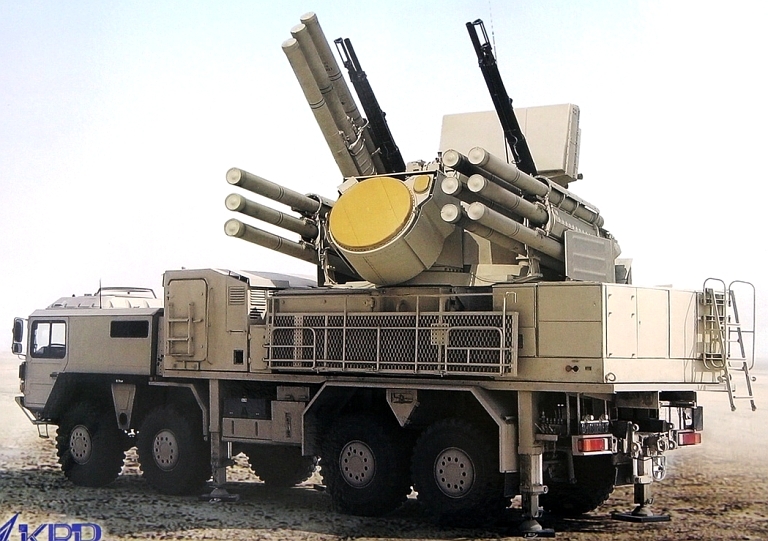 According to the IDF, its strikes targeted the Russian-made long-range SA-5, also known as the S-200, which is the predecessor of the more advanced S-300 and S-400; the Russian high altitude SA-2, or S-75; the Russian short- to medium-range SA-22, also known as the Pantsir-S1; and the SA-17 medium-range air defense system, also known as the Buk. On Thursday night, the military released footage of the strike on the Pantsir-S1, filmed direct from the Israeli missile as it struck the anti-aircraft battery. The Britain-based Syrian Observatory for Human Rights said at least 23 fighters were killed in the Israeli strikes, including 18 foreigners.